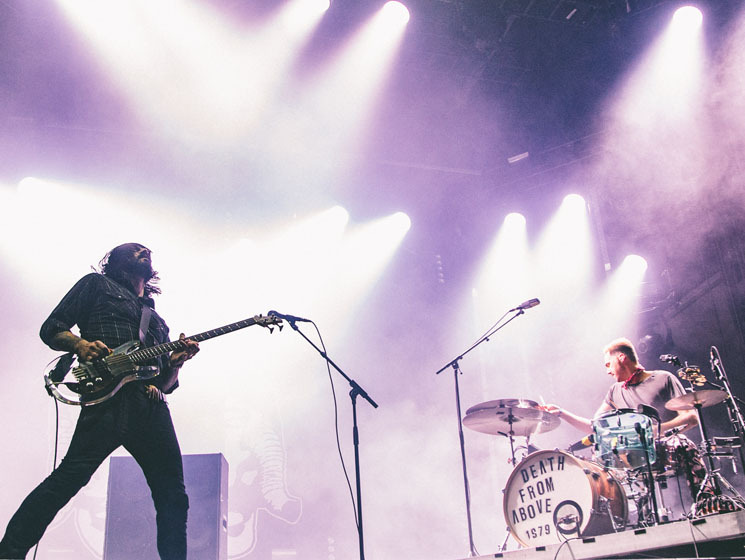 As fellow Toronto-based act the Weeknd began to close the festival with some sultry, chart-topping pop at the main stage, Death From Above (née Death From Above 1979) launched into a sonic assault on all things cute and sweet on the other side of Île Sainte-Hélène. Opening with "Right On, Frankenstein!" with Sebastien Grainger drumming away in flamingo-patterned pants and bright red shoes, the duo moved through a barrage of hits, sending the Sunday crowd into a nostalgic frenzy. Moving through "Virgins," and then "Going Steady" and "Romantic Rights" off 2004's You're a Woman, I'm a Machine underneath flashing, rainbow-coloured lights, the punk duo sent multiple mosh pits swirling across the festival grounds to the dismay of the exhausted security guards. With spaces between songs filled by Grainger's sheer charisma and love of a good anecdote — like sitting behind Die Antwoord on the flight here — the band moved into the song "White Is Red," which they dubbed their "Bruce Springsteen cover" with a laugh. Continuing onwards through their hour-long set with their latest single "Freeze Me" — Jesse F. Keeler's tight solo seemingly tearing a hole in the air — the band ended their timeslot strong, leaving the audience begging for more.